Full Description: SOLD - Originally stables to the old dairy, this unique mews style home was converted in 2002 and now offers 3 bedrooms - master ensuite, two further bathrooms, large open plan sitting and dining room with feature fireplace and woodburner, kitchen and large artists' studio which could also provide indulgent office space, workshop space or garaging. 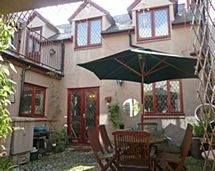 The private cobbled courtyard gives access to the sitting room and seperate access to the rooms previously used as an annexe - a nifty income spinner for the stuggling artist. This delightfully quirky home is hidden away in its' own no-through road corner of Minehead with full town amenities mere minutes away, bordered by the sea and open moorland of the Exmoor National Park. This listing has been viewed 10678 times.